It is not a April fool joke and the date is a strange coincidence. Our financial year starts from April 1 and thus the coincidence. This news is doing the rounds in the Blogosphere for a few days now. I was just waiting for the conventional media to break it so that I can quote it. ATM withdrawals from other bank branches will be free from Today – APR 1 2009. You can kiss all the priority banking deals a goodbye as free ATM withdrawals is one of the selling points for them. You can also stop searching for your bank ATM and just jump into the nearest ATM for your next withdrawal. India has 32000+ ATM’s.. Much less than what China has. Only recently did I mention about ICIC bank spinning off its ATM services so that it can expand faster. SBI has the maximum number of ATM’s in India. Now, ever since this came up my inquisitive mind kept asking me several questions. These might be more questions than answers. I would like your opinion on these. ATM set-up and expansion as the ICICI has pointed out is not one of the core banking. It is more of an overhead and requires money and other resources. With that background and with this new RBI rule coming into light, How will banks be motivated to expand their ATM’s? 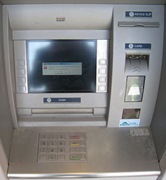 Wouldn’t every bank offer other banks ATM’s to the customers for their lack of penetration? Would this stagnate the growth of ATM’s in India?. At 30000 ATM’s for 1.2bn population India really cannot afford that. Would the banks restrict the amount of money one can withdraw for other bank ATM cards? The transactions will increase for smaller bank ATM’s. Would this be an added benefit for them? It is obvious that all bank customers will benefit from this. But what would it mean for the banks? PS : I wish everybody a happy new financial year. Next war is for water and India needs to fight it!